Me and my Ariens snowblower, clearing a path through 2 feet of snow. I’m one of the fortunate few who get to work from their home, and I love it. My schedule is completely my own and I get to do whatever I want, whenever I want. For example, I get to do the laundry, make my own lunch, vacuum the floors, fetch the mail, chase the cats off the countertops, prepare dinner . . . hey, wait a minute! Well, it doesn’t sound so good when presented like that, but it’s still better than going into an office everyday. Our house—and birdfeeder—blanketed in snow. One of the things I like best about working from home is that during the winter I get to play with my snowblower. And since we live in Connecticut, I get plenty of opportunities. In fact, lately that old two-stage Ariens and I have been spending a lot of time together. Guess I’ll use the back door! We’ve only had three snowstorms so far this winter, but last night a blizzard blew through and dumped over 24 inches of fresh powder, and we now have nearly 4 feet of snow on the ground. For the uninitiated (read: those smart enough to live in the sunbelt), a two-stage snowblower has a large spiral-shape steel auger blade that chops up the snow and feeds it into a high-speed impeller that shoots it out a steel chute. My Ariens snowblower can fire a 6-inch-diameter stream of snow up to about 30 feet. Now most people probably wouldn’t consider it much fun to wrestle a 200-lb., 7-hp beast up and down the driveway in 10-degree weather, but there’s just something about snowblowing that I really enjoy. First, I love cold weather so I’m always looking for an excuse to go outside during the winter. Plus, it’s great exercise and an excellent way to work up an appetite. And there’s a great sense of accomplishment to clearing all that snow and suddenly being free to leave the house. Somewhere in that truck-shaped snow bank is my Dodge Ram pickup truck! 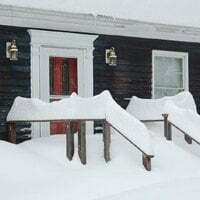 Back in 1993 we got snowed in for three days by 30 inches of heavy, wet snow that the snowblower couldn’t blow and snowplows couldn’t plow. I finally had to call in a backhoe to clear the driveway. Now I’m know that one day I’ll have to replace my cherished Ariens—it’s nearly 30 years old—with a new snowblower or perhaps even—gasp!—a truck with a plow (I’m not getting any younger either). But for now, the driveway is clear and we’re both well rested and ready for the next blizzard. My friend has a snow blower and when she started it up, it apparently backfired and smoke was coming out from it. Could this be due to a dirty carberator or is there something else that might be wrong with it? Use a wide pushbroom to push snow off the top, from the driver’s side across the roof to the passenger side. If you push the snow in the opposite direction, it’ll pile up against the driver’s side door and you won’t be able to open the door. Next, use the pushbroom to push or pull snow from the hood and trunk, making sure to dump the snow in the most convenient area. Don’t forget to leave room to drive the car out of the space. And be careful not to clear off the radio antennae. Remove snow from the windows with a long-handled snow brush. Here’s another trick to try: Before it snows, cover the car with a couple of plastic tarps. (Don’t use blankets or canvas dropcloths; they’ll freeze to the car.) Then, after it snows, simply drag the tarps–and snow–off the car. By the way, it’s better to use two or three small tarps than one big one because if you get a ton of wet snow, a single tarp might be too heavy to pull off. Hope this helps. Good luck!–Joe T.
any hints for getting snow off car after a big snow storm or blizzard.. that pick of your truck is what i usually have to clean off.. any suggestions .. on the proper way the top first sides front to back .. help ..